Jurgen Klopp promised Liverpool fans that after the international break, Joe Gomez and Alex Oxlade-Chamberlain would be fit again. During this fortnight, they’re training at Melwood in a bid to ready for consideration for our fixture with Spurs at the end of March. Neither will start, but it’s nice to know the English duo will be back in contention for the manic April fixtures, which include must-win Premier League matches and a Champions League quarterfinal with FC Porto. 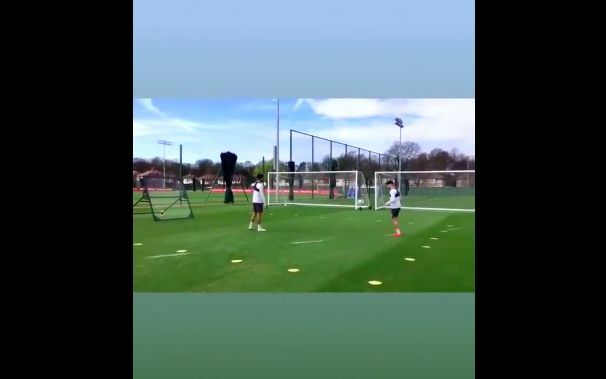 Today, Ox uploaded a video to his Instagram story, in which he and his central defensive team-mate compete in a game of ‘Wally’! They’re allowed three touches each – and have to rebound it off bouncy netting. Ox wins first, but Gomez ends up overall champion and takes much delight in filming the ‘losing press-ups’! Watch Ox’s Instagram story, here! With Joel Matip in such good form, we’re not sure if Gomez will be an automatic pick at the back until the summer. And with Ox being absent for such a long time, we’d suggest he’ll only be an impact sub himself – but both will be looking to nail down starting roles before 2019/20 – by completing a top notch pre-season.